TD: C’mere I want to show you something. TD: I know! We’ve been so busy doing things under the hood and in the cab we never noticed. Also, they are very dirty...try to ignore that. TD said they were ugly anyway and never liked them. Besides, everyone knows you can't wear white shoes when its not appropriate...never mind mismatched ones. We never noticed this until now because there were two matching ones on the left side of the truck, and the other two on the right side of the truck. Whatever side you were standing on looked normal. Your mind sees and remembers similar, but misses the obvious. 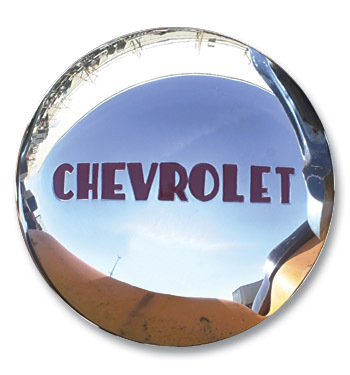 We're currently looking at Baby Moon hubcaps (emphasis on *looking*) as the new choice. You could use these to apply lipstick, they are just like mirrors. If we got these, then we'd need to do something with the flakey green painted wheels we currently have, because you can't put something like a sweet Baby Moon on flaking paint! And if we DO paint and pretty-up the wheels, then maybe we're back to talking about the differential again.